Vienna - the blood vesselsthat carry the organs and tissues to the heart of venous blood. With the exception of pulmonary veins that carry from the lungs to the left atrium of arterial blood. The combination of veins forms venous system, which is part of the cardiovascular system. The network of capillaries in the organs turns into the small postcapillary, or venules. They are at a considerable distance still maintain a structure similar to the structure of capillaries, but have a wider clearance. Venules merge into larger veins connecting the anastomoses (see), and form venous plexus in the bodies or near them. From plexus going veins carrying blood from the body. There are superficial and deep veins. Superficial veins are located in subcutaneous adipose tissue, starting from the superficial venous networks; the number, size and position them vary greatly. 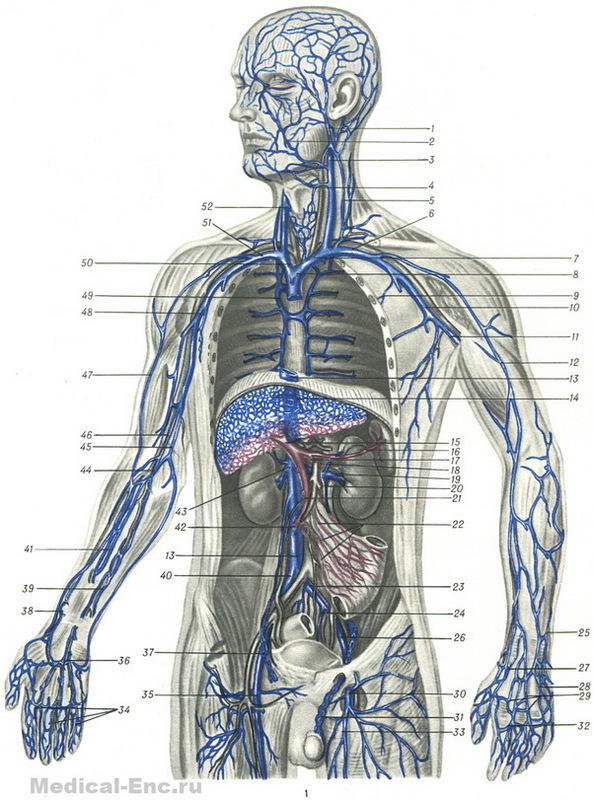 Deep veins, beginning on the periphery from small deep vein accompany artery; often one artery is accompanied by two Vienna, Vienna's companion"). In the merger of the superficial and deep veins formed two large venous trunk, upper and lower hollow vein, flowing into the right atrium, which also empties into the General flow of cardiac vein coronary sinus. Portal vein (see) carries blood from unpaired of the abdominal cavity. The wall of the vein consists of three shells: internal endothelial, medium - muscular and outer connective tissue. Low pressure and low speed of blood flow determine the weak development of elastic fibers and membranes in the venous wall. In some areas the vein walls held the adjacent spurs fascias and when wounded gape. The need to overcome gravity of blood in the veins of the lower limbs has led to the development of muscular elements in their wall, unlike the veins in the upper extremities and the upper half of the body. On the inner membrane of the veins have valves that open on the flow of the blood and facilitate the movement of blood in the veins towards the heart. 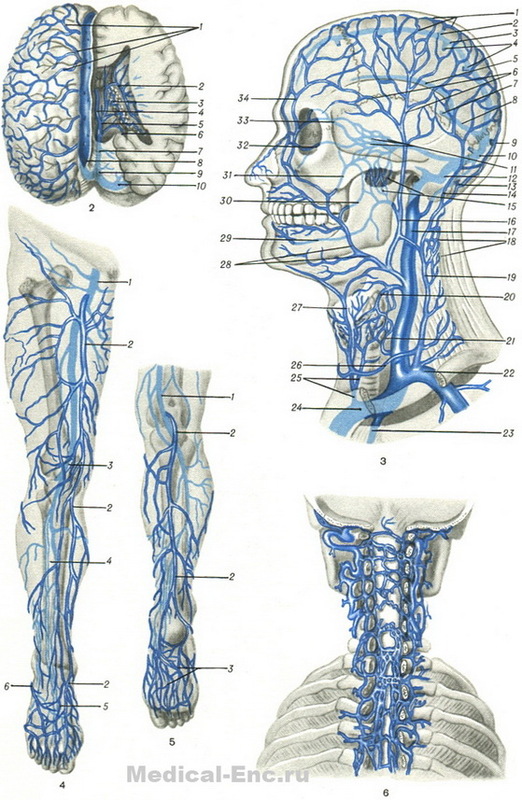 The wall of the vein abundantly supplied with blood and lymphatic vessels and nerves. Pathology veins - see Varicose veins, Thrombophlebitis, Phlebitis, Fleboscleros. Fig. 1. Venous system: 1 - v. retromandibularis; 2 - v. facialis; 3 - v. jugularis int. sin. ; 4 - v. thyreoidea sup. ; 5 - v. jugularis ext. sin. ; 6 - v. subclavia sin. ; 7 - v. brachiocephalica sin. ; 8 - v. cava sup. ; 9 - v. hemiazygos (w et. intercostaies post. sin. ); 10 - v. axillaris sin. ; 11 - vv. comltantes a. brachlalls sin. ; 12 - v. cephalica; 13 - v. cava inf. ; 14 - vv. hepaticae; 15 - v. portae; 16 - v. lienalis; 17 - v. mesenterica inf. ; 18 - v. suprarenalis sin. ; 19 - v. renalis sin. ; 20 - v. testicularis sin. ; 21 - v. mesenterica sup. ; 22 - vv. intestinales; 23 - v. iliaca communis sin. ; 24 - v. iliaca int. sin. ; 25 - v. basilica; 26 - v. iliaca ext. sin. ; 27 - the initial part v. cephalicae (v. cephalica pollicis); 28 - the initial part v. basilicae (v. salvatella); 29 - rete venosum dorsale manus; 30 - v. femoralis sin. ; 31 - plexus pampiniformis; 32 - vv. intercapitales; 33 - v. saphena magna; 34 - vv. digitales palmares; 35 - v. femoralis dext. ; 36 - arcus venosus palmaris superficialis; 37 - v. iliaca ext. dext. ; 38 - vv. comitantes a. radialis; 39 - vv. comltantes a. ulnaris; 40 - v. iliaca communis dext. ; 41 - vv. comitantes a. interosseae ant. ; 42 - v. testicularis dext. ; 43 - v. cava inf. ; 44 - v. mediana cubiti; 45 - v. basilica; 46 - vv. comitantes a. brachialis dext. ; 47 - v. cephalica; 48 - v. axillaris dext. ; 49 - v. azygos (et vv. intercostaies post, dext. ); 50 - v. brachiocephalica dext. ; 51 v. subclavia dext. ; 52 - v. jugularis int. dext. Fig. 2. Vienna brain: 1 - vv. cerebri superiores; 2 - v. thalamostriata; 3 - v. chorioidea; 4 - vv. cerebri internae; 5 - v. cerebri magna; 6 - v. basalis; 7 - sinus rectus; 8 - sinus sagittalis sup. ; 9 - confluens sinuum; 10 - sinus transversus. Fig. 3. Vienna head and neck: 1 - saphenous vein parietal region; 2 - v. emissaria parietalis; 3 - sinus sagittalis sup. ; 4 - vv. cerebri superiores; 5 - sinus sagittalis inf. ; 6 - v. temporalis superficialis; 7 - v. magna cerebri; 8 - sinus rectus; 9 - v. emissaria occipitalis; 10 - sinus transversus; 11 - sinus cavernosa; 12 - sinus slgmoldeus; 13 - v. emissaria mastoidea; 14 - v. occipitalis; 15 - plexus pterygoideus; 16 - v. retromandibularis; 17 - v. jugularis interna; 18 - plexus vertebralls posterior; 19 - v. jugularis ext. ; 20 - v. thyreoidea sup. ; 21 - v. thyreoidea inf. ; 22 - v. subclavia; 23 - v. thoracica Interna; 24 - v. brachiocephalica sin. ; 25 - v. thyreoidea ima (plexus thyreoideus impar); 26 - arcus venosus juguli; 27 - v. jugularis ant. ; 28 - v. facialis; 29 - v. alveolaris inf. ; 30 - v. buccalis (s. buccinatoria); 31 - v. faciei profunda; 32 - v. ophthalmica inf. ; 33 - v. ophthalmica sup. ; 34 - v. supraorbital. Fig. 4. Superficial and deep veins of the lower limbs (front): 1 - v. femoralis; 2 - v. saphena magna; 3 - v. poplitea; 4 - vv. tibiales ant. ; 5 - rete venosum dorsale pedis; 6 - v. saphena parva. Fig. 5. Superficial and deep veins of the leg and foot (rear view): 1 - v. poplitea; 2 - v. saphena parva; 3 - rete venosum plantare. Fig. 6. External and internal vertebrates (venous) plexus [plexus vertebrales (venosi) ext. et interni).